Going back to school while working full-time means that study sessions are a precious thing. Your time is limited, and you need to get things done. One of the best ways to maximize your time dedicated to coursework is to have a distraction-free space. 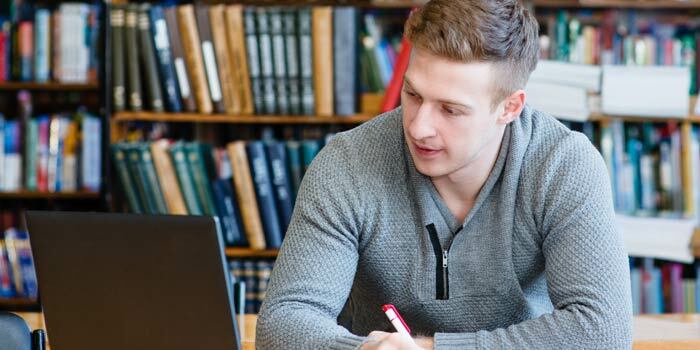 Here are five tips for creating the perfect study area to keep you productive. You need a study space just for you that is separate from your other activities. Keeping this space exclusive to your studies will help you switch gears and focus when it's time to get coursework done. Doing this also helps minimize distractions. Unsightly clutter, like bills and mail, can draw your attention away from the task at hand. It also allows you to control your environment. For example, if you're the type of student who needs absolute silence while you work, having a space away from the chaos in your home is key. You're here to work, but your desk doesn't have to feel like a prison. Add some personal touches, like photos and inspiring quotes, to make the space feel more cozy. It doesn't have to be Pinterest-perfect — just avoid going overboard on the décor so your study space remains distraction-free. There is a reason that experts do not recommend studying on your bed or a comfy couch — if you get too comfortable, you might just doze off. However, it is crucial to have a chair and desk that are comfortable to sit at so that your attention is on your work rather than the crick in your neck. If prefer to move around a bit, consider a standing desk option. Save yourself time by having all of your school materials in order. From notebooks and printed-out course reading material, to your tech accessories (e.g. mouse, headphones, etc. ), having a place for everything will help you move through your coursework without interruption. Having a clean computer desktop is just as important as having a clean desk. Organize digital files (e.g. word documents, downloaded ebooks, etc.) by creating a separate folder for your coursework with subfolders for each course you are taking. This makes finding documents quicker and easier. Completing an online degree program doesn't have to feel like an impossible goal. Putting a system in place and making a study area that is just for you will help you keep your mind in the zone and free from pesky self doubt.